Come do your holiday shopping while supporting your local artists and crafts people. 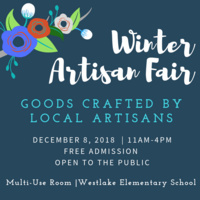 Westlake Elementary is bringing back this holiday community event for the 7th year! At this free admission event we celebrate fine art and handcrafted gift items. Over 30 Artists and Craftspeople will offer jewelry, art, leather goods, photography, pottery, soaps, plants, knit, woodworking and edible goodies. Find the unexpected gift perfect for holiday giving. Please park in the residential area or the parking lot of the church adjacent if the limited spots on campus are taken. Well I am really glad to have found this information about this event. Please check out https://australianwritings.com.au/do-my-assignment-for-me/ as well for helpful writing tips! We can discover data about DCIG which is best item and it is consummately structured. According to http://www.jacksonwhitewaterrafting.com/ it is exceptionally helpful numerous individuals are utilizing this. It has high caliber. Numerous individuals like it in particular. We can likewise utilize it in ventures and undertakings. We can get best model of iphone mobiles which are helpful. We can discover stunning programming's in iphone. Iphone and ipad are impeccably structured and https://landscapedesignofboca.com/ like its highlights. we can discover best touch screen and can appreciate distinctive applications.